LARIAT.NET is a local Internet service provider based in Laramie, Wyoming. Founded in 1992 as a community network and relaunched as a private ISP in 2003, we were the world's first wireless broadband provider and have more than 20 years of wireless Internet experience -- more than anyone else! We remain an innovator in wireless technology and Internet security, and are the only Internet provider serving Laramie which is locally owned, locally operated, locally managed, and not a franchise or chain. Try a side-by-side test; we give you faster browsing for the money than any other ISP in Laramie. Best of all, our fixed wireless Internet service -- our most popular offering -- lets you "cut the cord." You don't need a wired phone line (as you would to get a reasonable price for DSL) or cable TV (as you would to get a decent price for cable modem service). We don't force you to buy a "bundle" that includes stuff you don't want. There are no long term contracts or "surprise" price increases. Superior, secure high speed wireless Internet access, with all-inclusive monthly charges starting at $30. (Click the link to the left for details; also see our Frequently Asked Questions page and our flyer for more information.) We can provide service to any customer, from a user with a single machine to a large corporate office building. New! Premium Internet telephone service, with superior sound quality and monthly charges much lower than those of the telephone company. Your existing number can be transferred to this service (it's called Voice over IP, or VoIP) within two weeks after you sign up; no need to inform friends and family of a new number. The VoIP adapter box lets you keep on using your existing telephone(s). We'll even help to hook it up if you order it along with new Internet service. Note: We looked long and hard before selecting a VoIP service with which to partner. 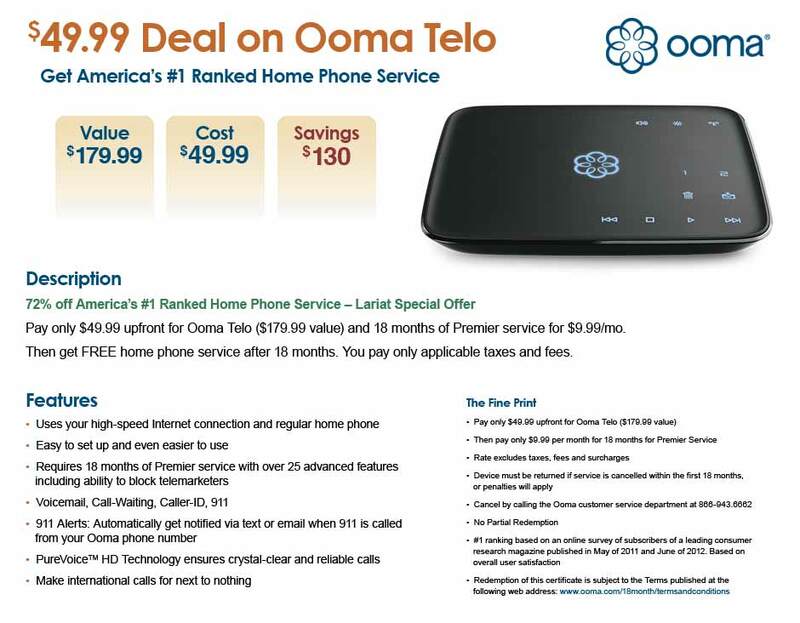 This one, which is called Ooma, has the best sound quality we've encountered plus an incredible number of innovative high tech features that will make your regular telephone line seem ancient and obsolete. They include unlimited nationwide calling, digital voicemail (you can even have your voice messages e-mailed to you), telemarketer blocking, three way calling, a choice of wireline (1+ for non-local) or cell phone dialing styles, the ability to ring your home and cell phones simultaneously so you can take the call on either, and more. Once you've used them, you won't want to give them up. You can also take the VoIP adapter with you (for example, if you go on vacation) and connect it to the Internet wherever you go. The service and telephone number will "follow" it! The cost of our Internet plus VoIP beats any Internet+phone "bundle" from a telephone or cable company. And if you're a rural telephone customer paying "Zone 3" prices, the savings on telephone service alone will more than pay for your Internet. Click here (Link will open a new browser window or tab) to learn more. Wireless "hotspot" service and business hotspots for laptop users. Networking equipment, including firewall routers, cables, and wireless gear. Please note that we do not do general computer sales, maintenance, or repair, but can refer clients to reputable local computer stores and consultants who do. FREE INSTALLATION SPECIAL! For a limited time only, LARIAT.NET is offering free installation of wireless Internet (normally $75). You buy the equipment; we install it at no charge. We'll even throw in the cable (average cost $30) and lightning protector ($15). And because you own your wireless equipment, there's no rental fee! See our wireless page for more. FIREWALL ROUTER SALE! New or existing LARIAT subscribers can buy a Linksys E1200 or E900 N300 router, preconfigured by our expert technicians and ready to run, for $45 while supplies last. (These two models have identical hardware, but the E900 leaves more free memory for your network data while the E1200 adds extra software features such as a "guest" network.) We also have the reliable, tried-and-true Linksys E800 (a "basic" N150 router that's more than sufficient for most home networks) for $30. Get a quality router for less than you'd pay at Wal-Mart... expertly configured to work perfectly with the LARIAT network! We also sell custom wireless repeaters, wireless access points, and wired routers as well as network cables and adapters. We sponsor LARIAT.ORG, Laramie's Internet users' group. Click the links above for more information or call us at 307-761-2895. You may also e-mail Brett for details, support, or price quotes. Our Web server runs FreeBSD, a free version of Berkeley UNIX available via the Internet. For more information, click on the logo below. Note: We're often asked why our Web site's design is rather "plain," without lots of fancy graphic elements, menus, pop-ups, pull-downs, etc. The answer: it has been designed for easy access from mobile phones, by dialup users who have not yet obtained high speed Internet, and by the visually impaired, who often rely upon text-based Web browsers and talking "screen readers." Mobile browsers are easily confused by complex pages, and screen readers can't make much sense of pages with excessive graphic content. We can help you to design and post Web sites which are readily accessible to all and conform to the Americans with Disabilities Act (ADA). Index terms, including common misspellings: Laramie Wyoming ISPs, LARIAT, community, network, Laramie broadband, Wyoming, Albany County, Internet access in Laramie Wyoming, Internet Provider near University of Wyoming, ISPs in Laramie WY, WISP, Laramy, dialup, cable modem, Wyoming Internet Provider, DSL, Laramie wireless Internet, hotspots, Wi-Fi, Laramie WISPs, UNIX, wireless broadband, network equipment, consulting, hosting, backup, routers, e-mail, inexpensive, cheap, access, Laramie ISPs, Wyoming ISP.